Two weeks today! Please help to spread the word! EVENT ANNOUNCEMENT: Digging for Dementia’s Hallowe’en Harvest! Hello, lovely Digging for Dementia supporters! Apologies for the recent silence; as those of you who follow DFD on Twitter will be aware, the past few sessions have been cancelled due to illness. Thankfully, I’m feeling better now, and I’m ready to welcome Autumn with a Digging for Dementia spectacular! Our veggies are almost ready to harvest, and I thought it would be fun to make an event out of it to celebrate our achievements in recent months. It’s also almost Hallowe’en, which is always a great time for a party! So on October 27th at 12pm, I’ll be holding Digging for Dementia’s Hallowe’en Harvest, and you are all invited to help the group to harvest our vegetables, and enjoy gruesome games, petrifying pumpkins, spooktacular sweets, terrifyingly tasty treats, and lots more! 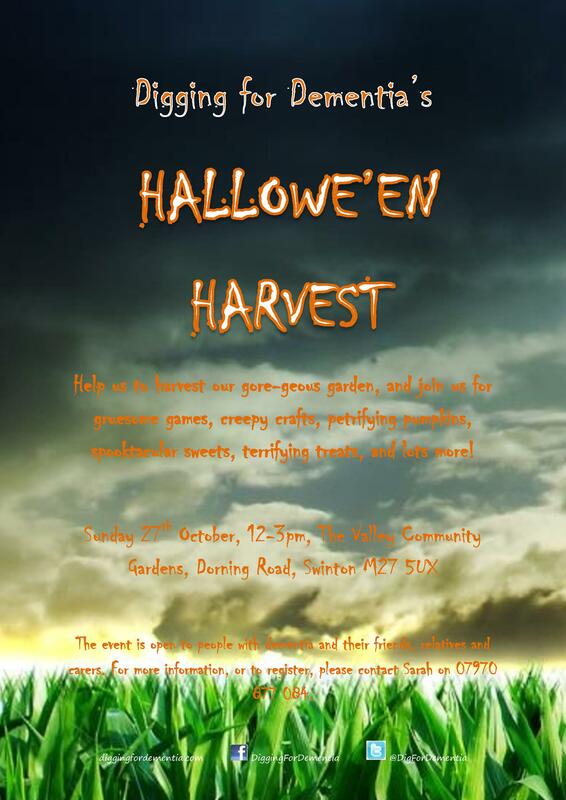 The event will be held on Sunday 27th October, from 12pm-3pm, at the Valley Community Gardens in Swinton. The event is open to people with dementia, their friends, relatives and carers, and anyone else who’d like to join in the fun! Further details and a gore-geous event poster to follow. Hope to see you there! The recent change in weather conditions has necessitated a swift re-evaluation of Digging for Dementia’s development over the next few months, and I wanted to share with all of you the decisions I’ve made regarding the group’s winter activities. 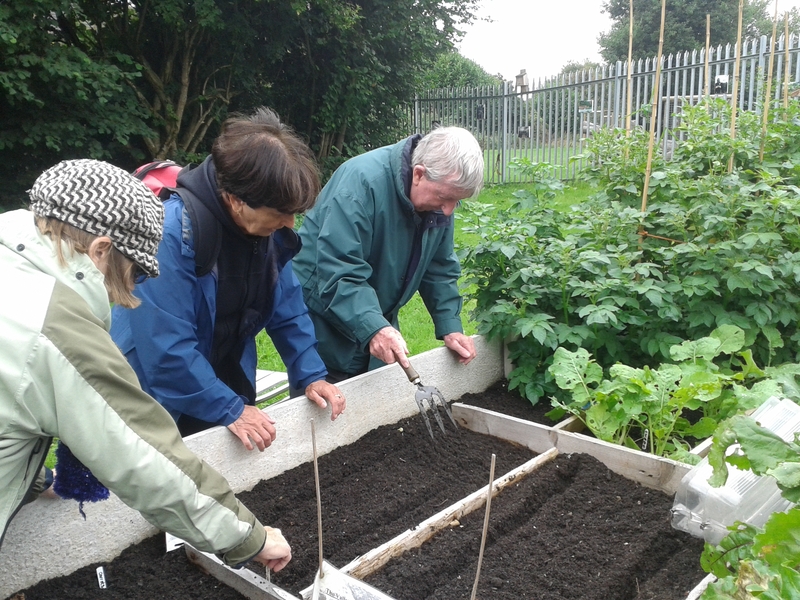 Several members of the group have informed me that they are struggling to attend every week now that the weather’s getting colder, which is understandable, particularly in the case of older people and those with illnesses. I’ve sadly been forced to cancel the past few DFD sessions due to a nasty chest infection, and I’m anxious not to subject any of the group to becoming poorly by continuing weekly sessions over winter. I’ve therefore decided that from now until Spring, I will plan a small number of seasonal events, including a harvest festival to gather up the vegetables we’ve grown, a Hallowe’en-themed event, and a Christmas crafts session. I would have loved to plan an event for Bonfire Night, but I’ll be trekking my way across New Zealand by then, so sadly we shall have to miss out on fireworks. I will publicise each event as it approaches, and I hope that some of you will be able to attend. I’ll have plenty of hot drinks and treats on hand while we work, so we shouldn’t have to worry about the cold! 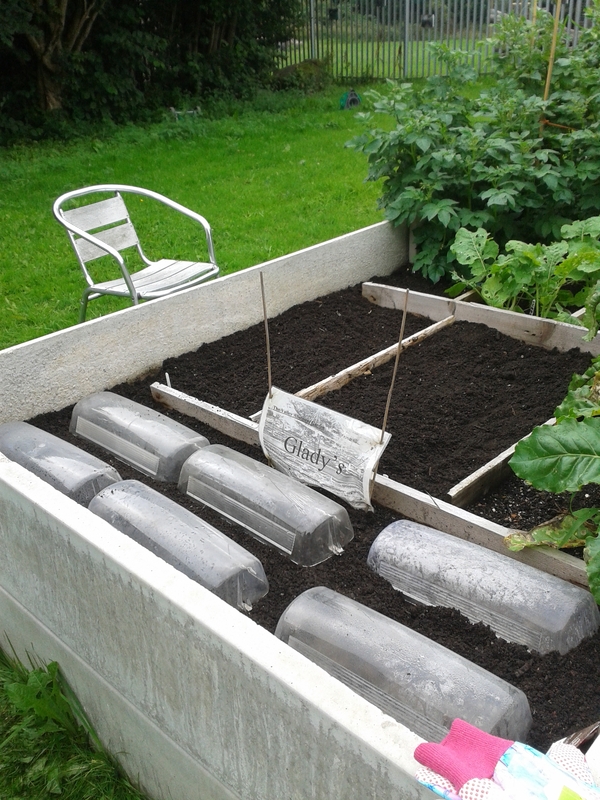 I will recommence the weekly gardening sessions in the Spring, once we’ve all thawed out a bit and our little plot of land is ready for planting lots of veggies. I hope that you’ll all continue to support the project over Winter, and that I’ll have an equally wonderful group in the Springtime. Thank you for all of your support as always, and I hope to see you at some of Digging for Dementia’s upcoming seasonal events! Apologies for the recent lack of updates; I started a new day job and had a poorly doggy to contend with, so life has been rather getting in the way. 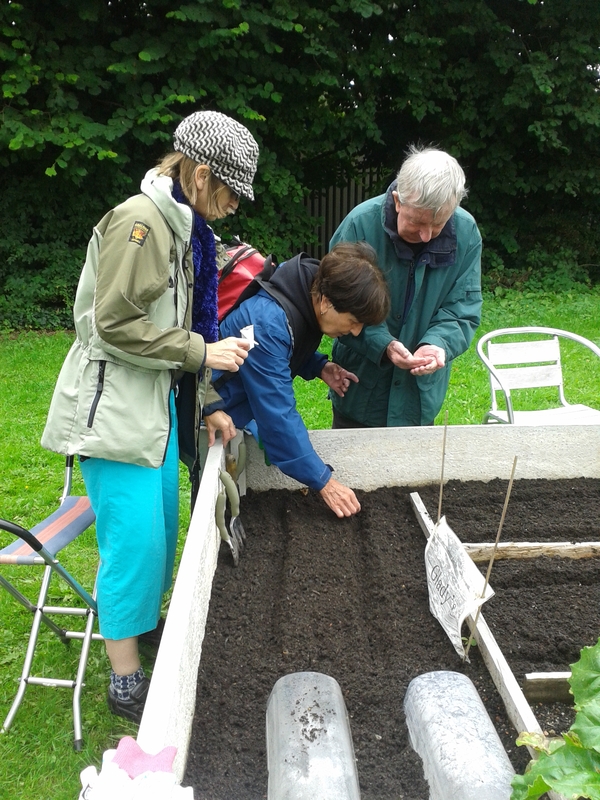 Digging for Dementia has, however, been continuing, and our little plot is making great progress! 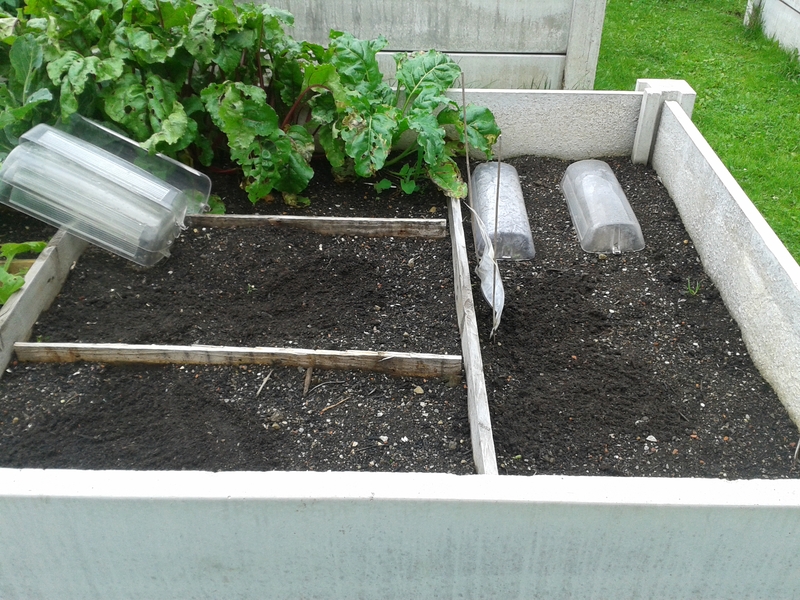 During our first session, we prepared the soil ready for planting carrots, radishes and beetroot. As it’s a bit of an odd time of year for growing, we decided to stick to hardier root veg in the hope that we’d get a decent crop. After preparing the soil, we planted our seeds, and lots of fun was had! 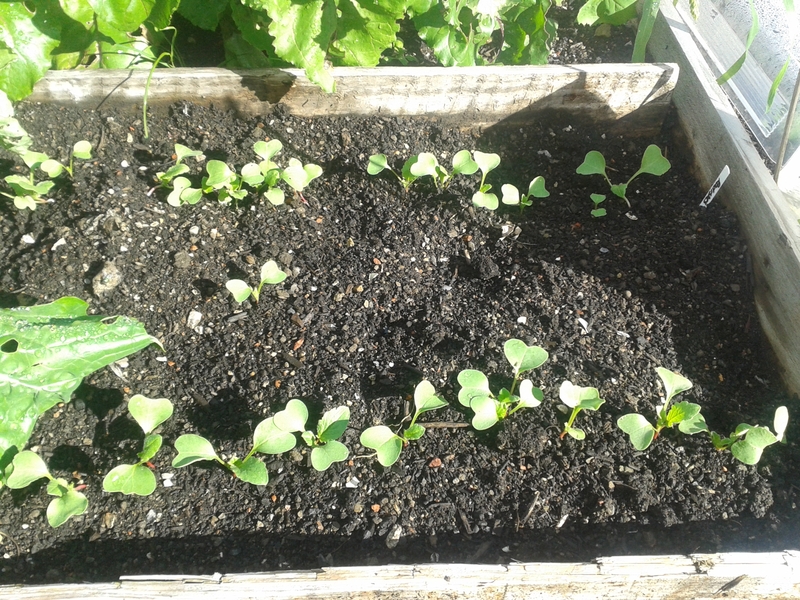 When we arrived for session two, we were delighted to discover that our seeds had sprouted brilliantly! 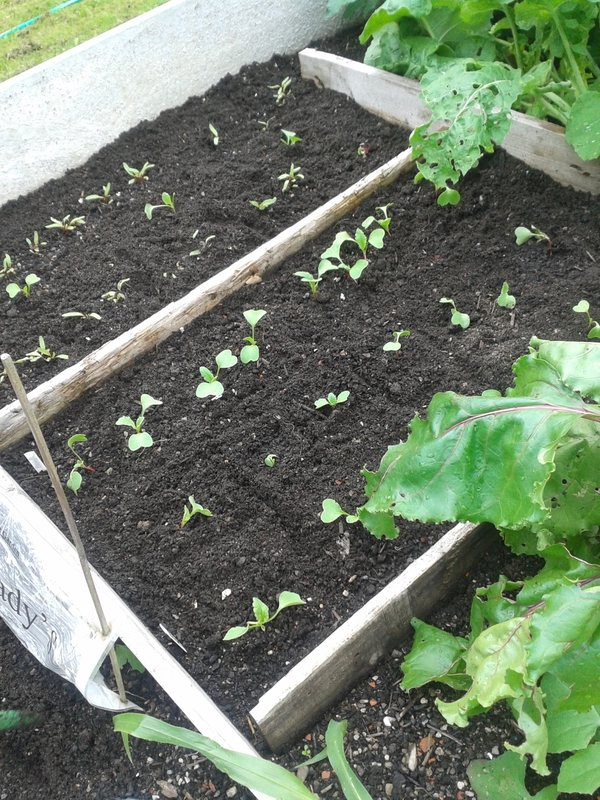 The radishes in particular have sprouted really well, but everything is looking good. 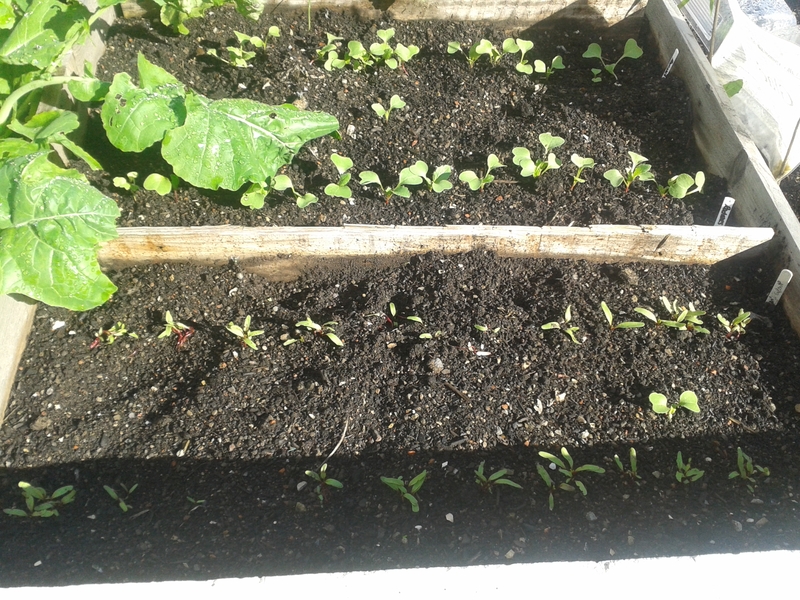 We spent session two thinning out the seedlings, and transplanting some of the radish seedlings elsewhere in the bed to give them a better chance of growing. We still have plenty of room in the group for newcomers, so if you’d like to join us, please feel free to come along! You can find more information about the sessions here.